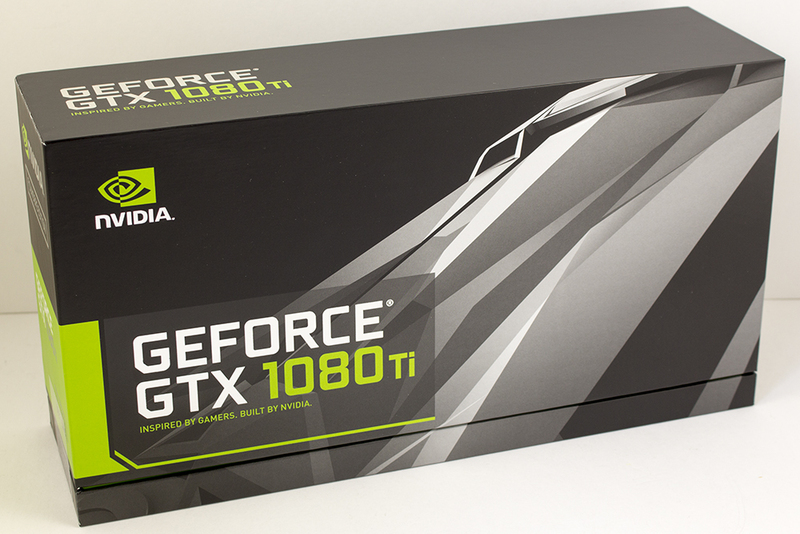 It’s new, it’s a flagship, it’s the NVIDIA GeForce GTX 1080 Ti. 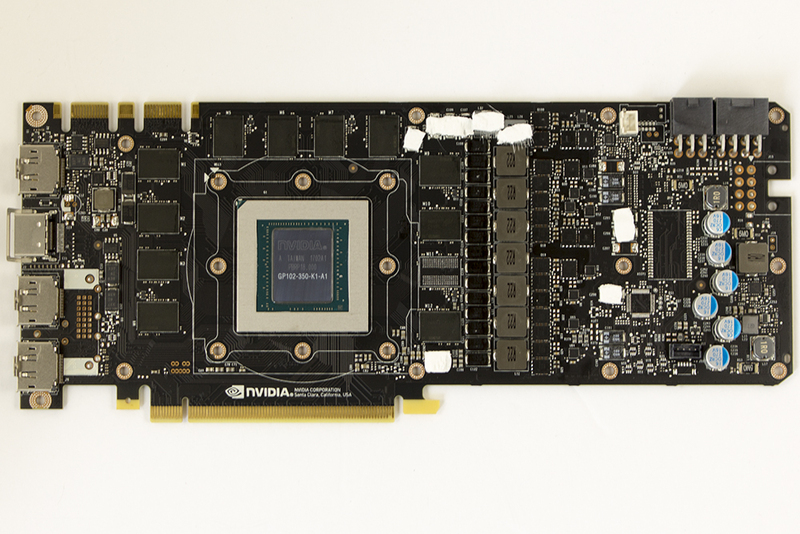 The only question about how fast this GPU will be is whether it will knock the Titan X Pascal off its throne. This is the reference design for all the GPU partners to base designs from (or design up from), so expect numbers to climb from what you see here today as new cards release! 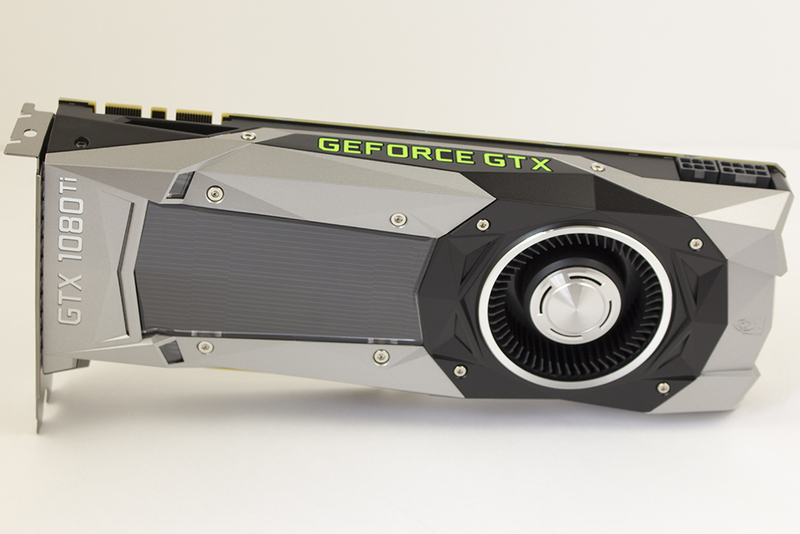 Here it is, the new mac-daddy from NVIDIA. 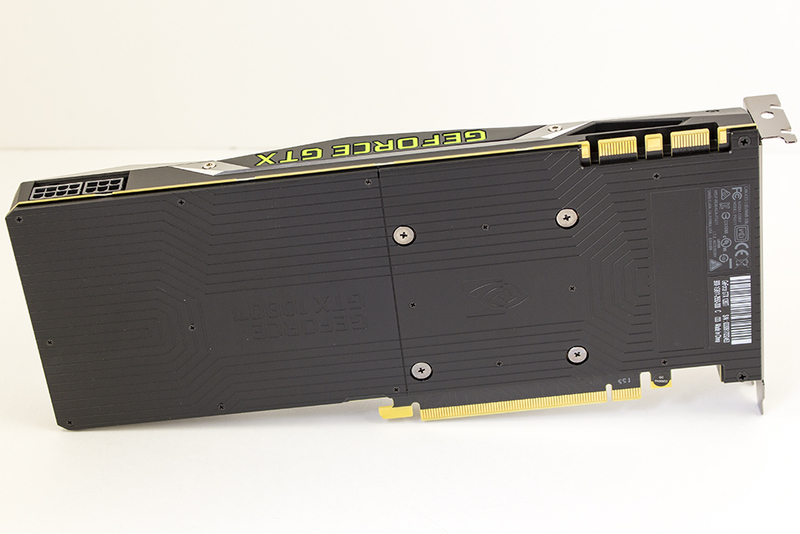 We’re looking at 11 GB of GDDR5X pushing 11 Gbps of bandwidth (this is faster than the Titan X Pascal), the same number of CUDA cores as the Titan X Pascal, and the highest clock speeds of any Ti card to date. The DVI port has been dropped in preference of better cooling performance, due to more air flow through the PCIe bracket. One of the first things you may notice is the odd number of vRAM available, at 11 GB. Note, this will NOT be a fiasco like the GTX 970. This is due to the full 28 Streaming Multiprocessors (SMs) of the GP102 being used, where the GTX 970 had a cut down number of SMs. Here we’re looking at all the same features that came with Pascal, I’ll rehash a couple very quickly. VR Ready Discover next-generation VR performance, the lowest latency, and plug-and-play compatibility with leading headsets-driven by NVIDIA VRWorks technologies. 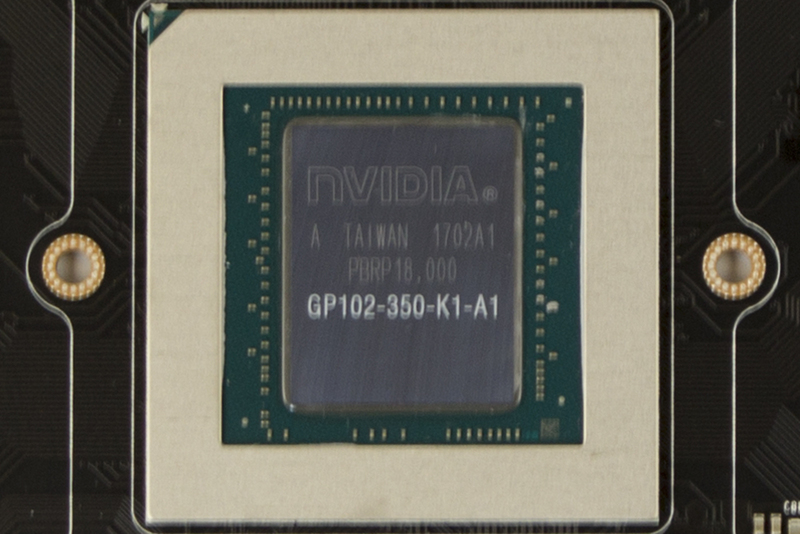 NVIDIA SLI w/ HB Bridge Support NVIDIA’s new SLI HB bridge doubles the available transfer bandwidth compared to the NVIDIA Maxwell architecture. NVIDIA GameStream Stream extreme GeForce GTX PC gaming experiences to portable device like NVIDIA SHIELD with super-smooth, low-latency performance. NVIDIA G-SYNC NVIDIA G-SYNC monitors feature revolutionary NVIDIA technology that eliminates screen tearing while also reducing input lag. 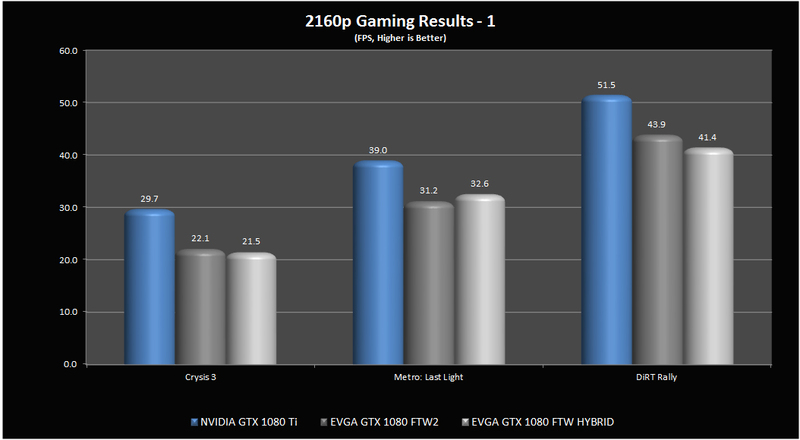 The result is the smoothest, fastest, and most responsive gaming experience ever seen. NVIDIA GPU Boost 3.0 Dynamically maximizes clock speeds based on workload and allows enthusiast-class controls such as temperature target and fan controls, extra over-voltage headroom, and optimizations for water-cooling solutions. This allows gamers to push performance to new levels. 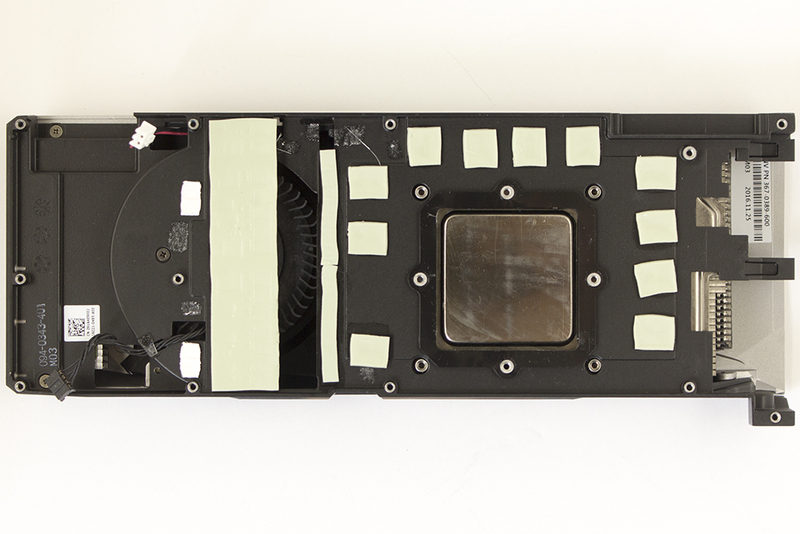 Below is our gratuitous picture of what GPU-Z looks like when it’s reading from the card. 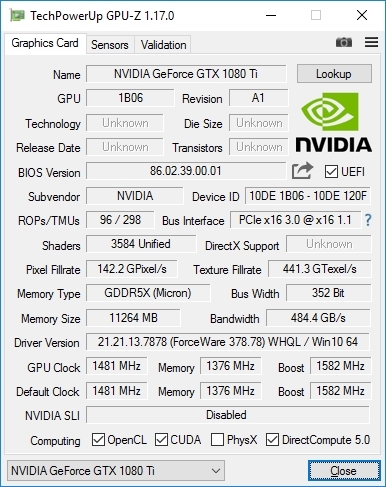 There are a couple of numbers which do not register, or are inaccurate, due to the newness of this GPU. To fill in the blank spots we can see the process is 16 nm with the die size coming in at 471 mm squared. This die has 12 billion transistors. The core has 88 ROPs and 224 TMUs on the backend of 3,584 shaders. With the clock speeds, this yields a 130.2 GPixel/s and 331.5 GTexel/s throughput. 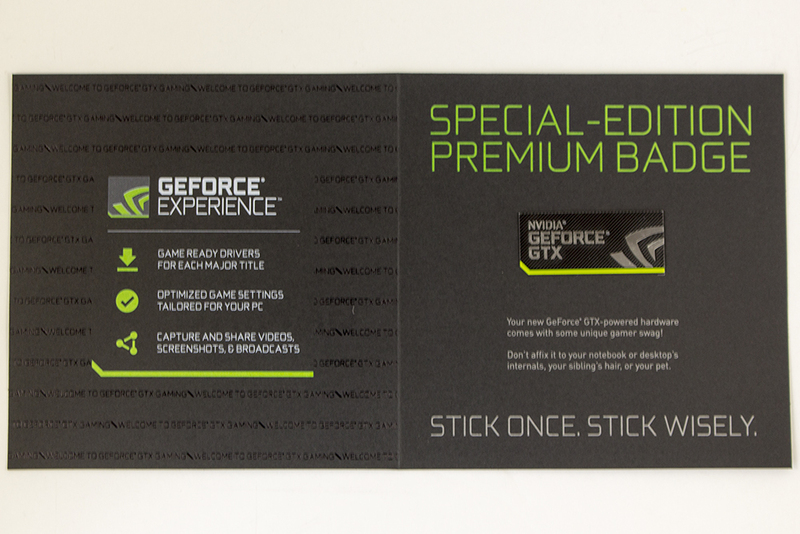 As you will also note below, the card comes in at 1480 MHz clocks. 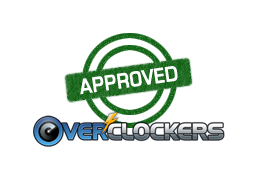 Boost clocks are 1582 MHz, but we all know the actual boost clock is what counts. 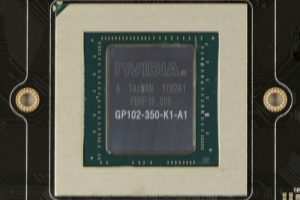 Memory speeds are 1376 MHz (11,000 MHz GDDR5X). The included accessories are a couple of manuals, a case badge, and a DisplayPort to DVI adapter. 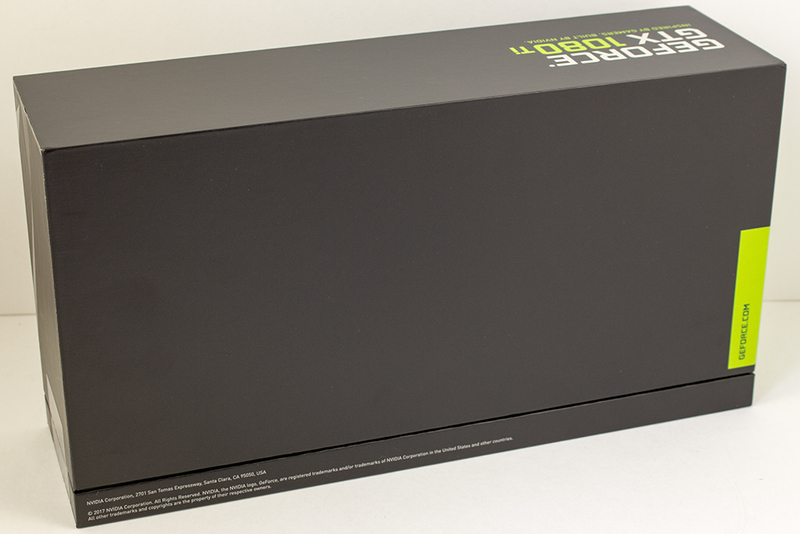 This is how NVIDIA is making up for better cooling by dropping the onboard DVI port, and I’m a-okay with it! We’ve seen the Founders Edition a few times now, and this looks much the same. 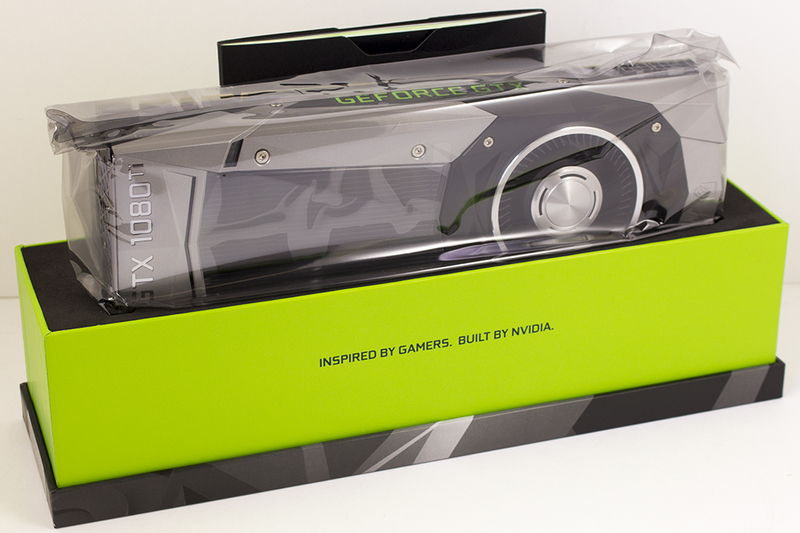 It’s a simple blower style GPU, silver/black/grey in color, with GEFORCE GTX written in green on the front edge. 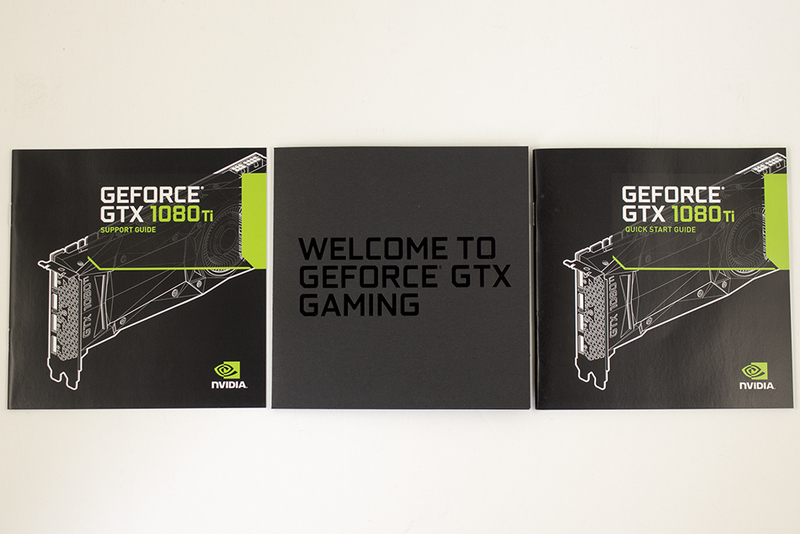 There’s a solid black backplate on the whole card. 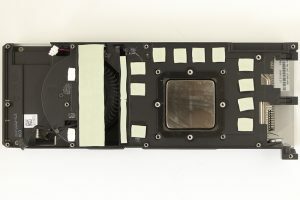 This is where the main difference lies in the GTX 1080 Ti, where they removed the DVI port to allow for increased airflow. We see the three DisplayPort connections and one HDMI connection here. 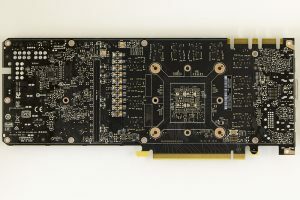 On the opposite end of the card there is one 8-pin and one 6-pin PCIe power connection. Next up, a few clear pictures of the reference design PCB. This is what all the partner cards will use unless they’ve designed their own PCB. 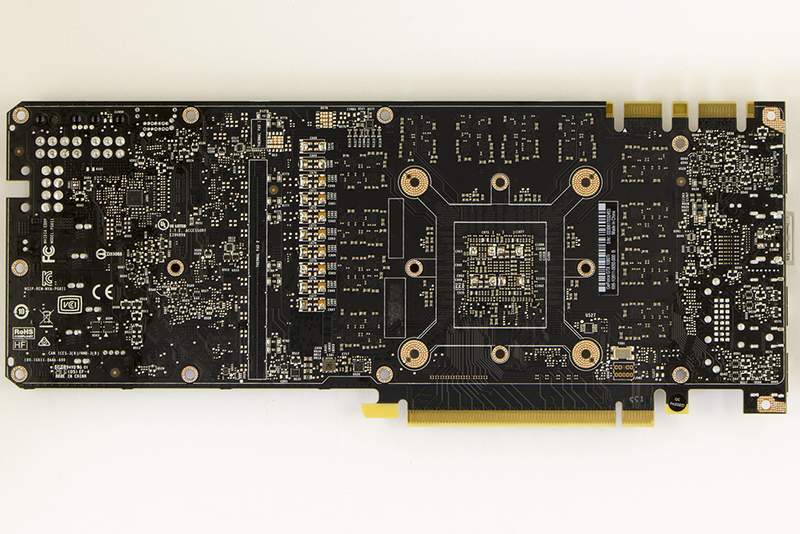 In the reference design of the GTX 1080 Ti the VRM design incorporated by NVIDIA is a 7-phase 2x dual-FET arrangement. 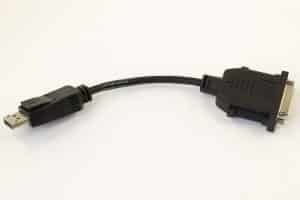 By their spec this is able to supply up to 250 A to the GPU. This was all to chase higher boost clocks, less heat, and less noise. 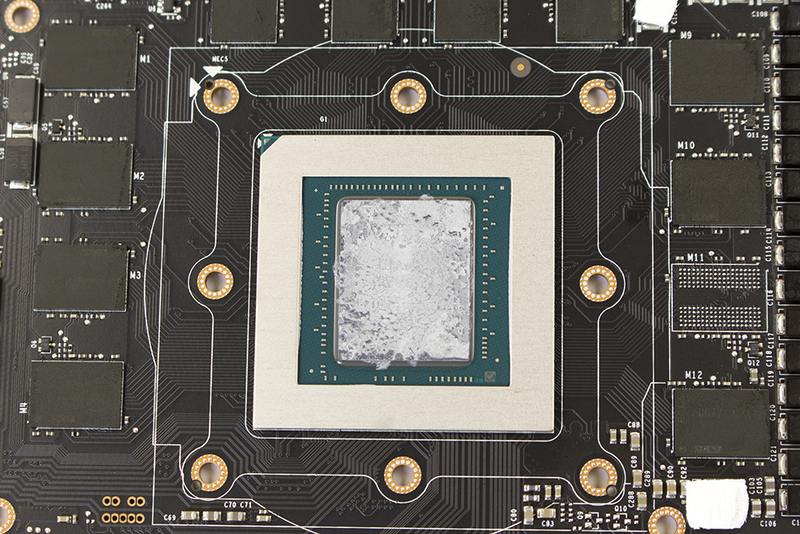 The last two pictures below we see great TIM contact with the GPU die, the 11 vRAM chips (1 GB each), and where all the thermal pads on the heatsink are located. 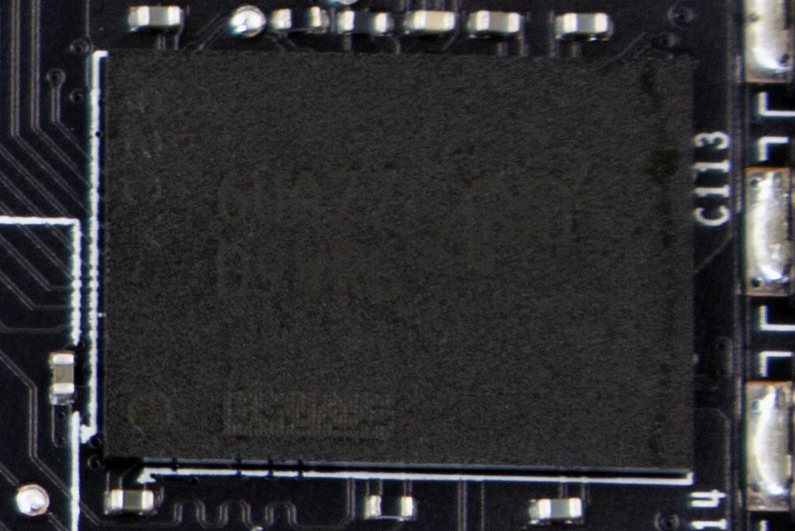 Now we get a clear shot of the GP102 die and a less-clear shot of the Micron vRAM chip. 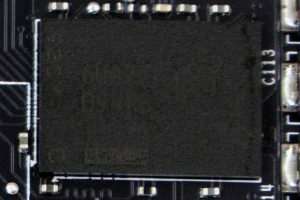 Due to the newness, I was unable to find the model of the vRAM chip on the Micron website. It seems the model is 6UA77D9WRL, but I honestly couldn’t get a good shot of that. To start our results section we’ll go through synthetics first. 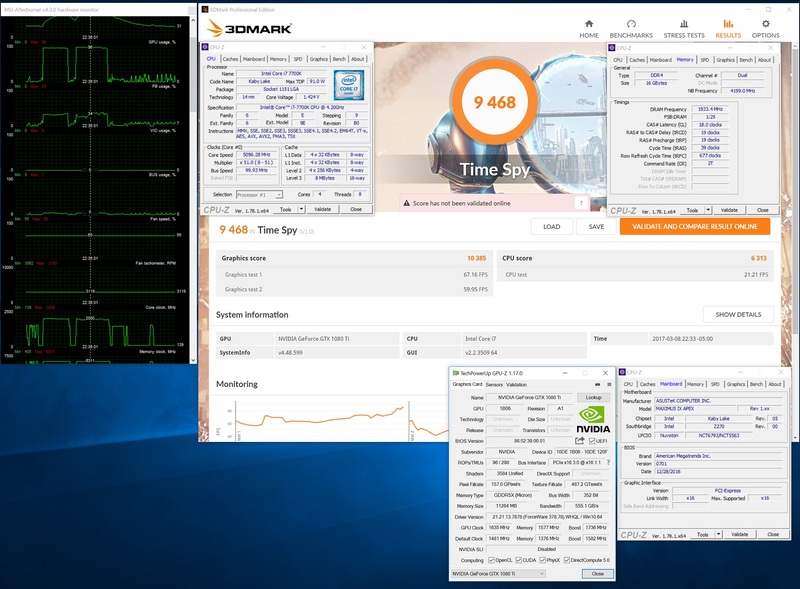 3DMark Fire Strike Extreme and 3DMark Time Spy are the first two benchmarks up. Here we see the GTX 1080 Ti clean out both 1080 offerings by 15-20%, even though they’re rocking a factory overclock. This is definitely enough to put the GTX 1080 Ti on par with a Titan X Pascal. Moving on to the next two tests, HWBot Heaven Extreme and Unigine Valley, we see something interesting. 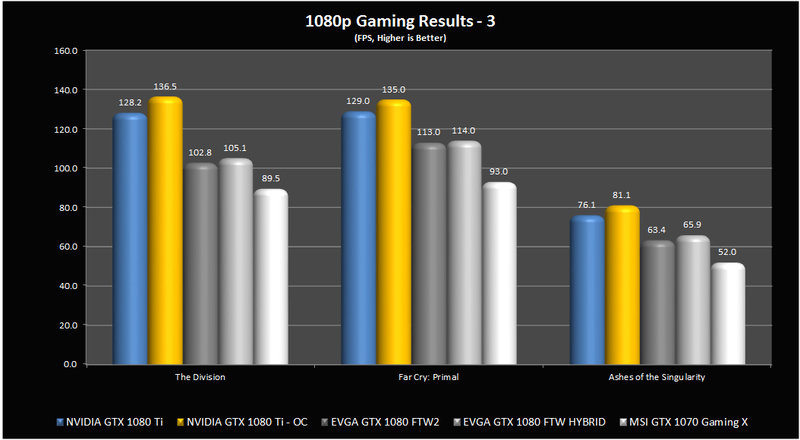 It seems like Heaven has a bit of a CPU bottleneck, but Valley shows the same 15-20% gap. 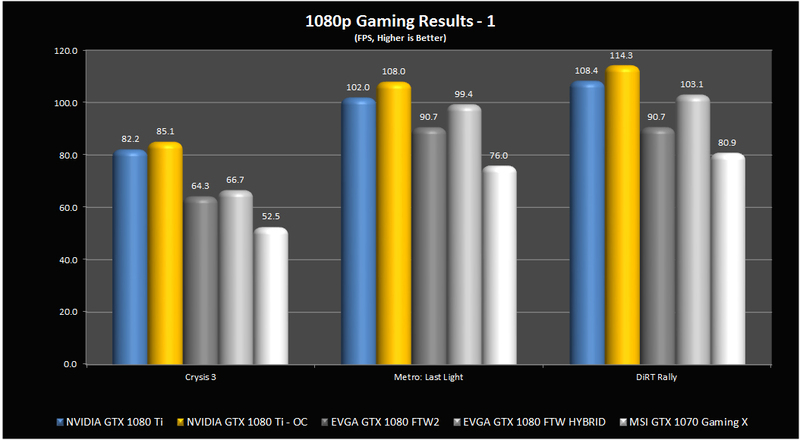 For our first set of gaming benchmarks we’ll look at Crysis 3, Metro: Last Light, and DiRT Rally. The gap isn’t quite as big as expected on Metro, but this is likely due to the factory OC’d cards used for the GTX 1080 results. 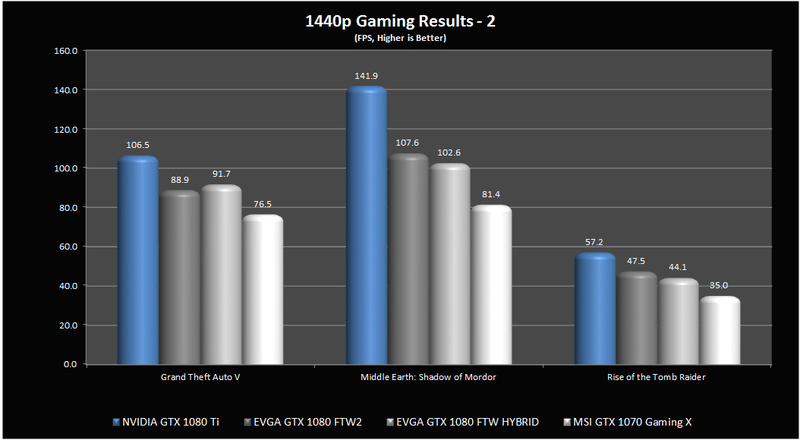 Otherwise, we’re looking at huge improvements in framerate. The longer benchmarks, like DiRT, show the Hybrid much closer to the Ti thanks to the watercooler in use. The next set of gaming results testing Grand Theft Auto V, Middle Earth: Shadow of Mordor, and Rise of the Tomb Raider looks a little interesting. 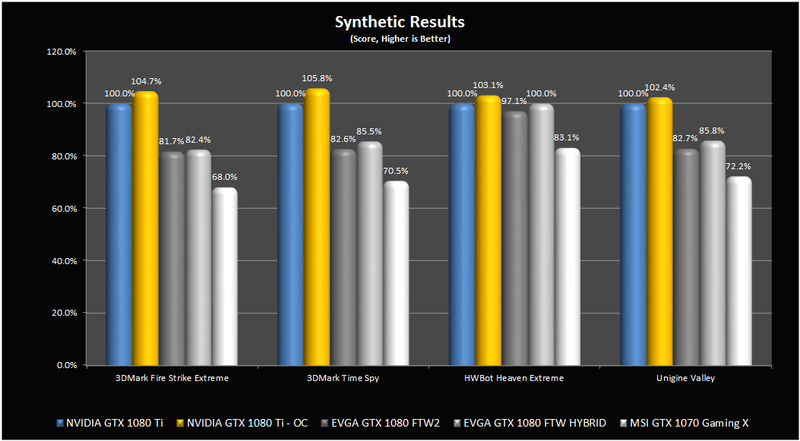 Seems like we’re seeing some CPU bottleneck on GTAV, but the other two games showed notable improvements. 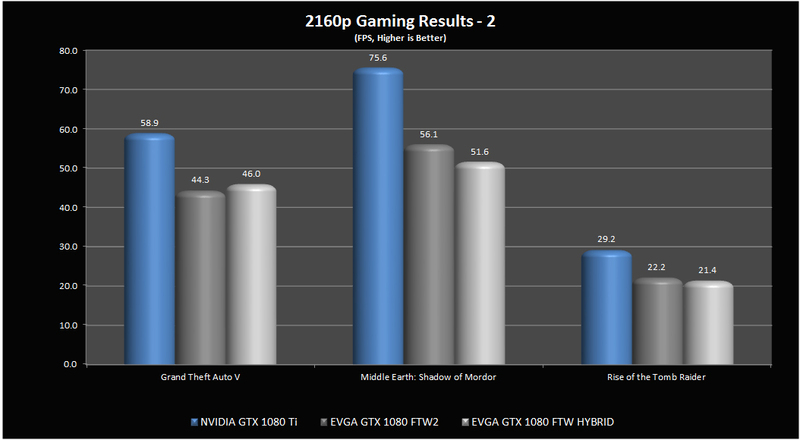 Especially Middle Earth, where we find almost a 25% jump in framerate. Our final set of gaming results goes through The Divison, Far Cry: Primal, and Ashes of the Singularity. All three games here showed great gains with the GTX 1080 Ti, with overclocking showing great scaling as well. 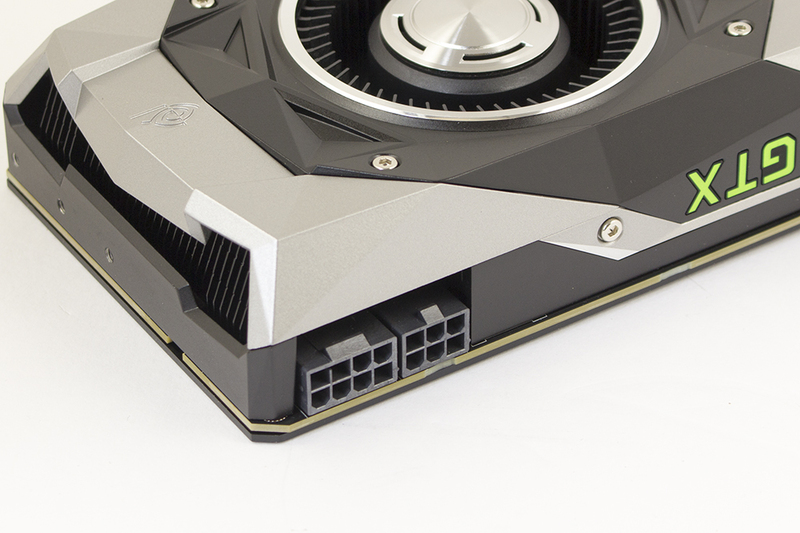 High resolution, where the GTX 1080 Ti absolutely shines. When compared to the 1080 results games that were borderline playable are now playable, games that were borderline smooth are now smooth. Note we only have 2160p results on the GTX 1080’s in use here, not the 1070. 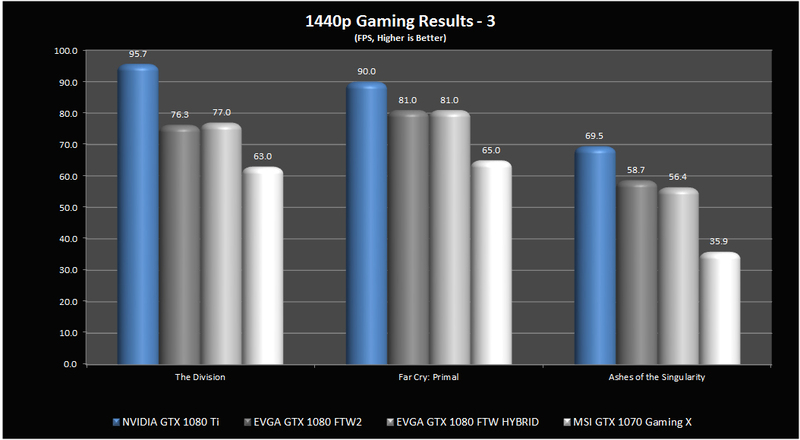 We see Crysis 3 hitting so close to a full 60 fps at 1440p now, I’m sure some partner cards with factory OC’s will see that number. 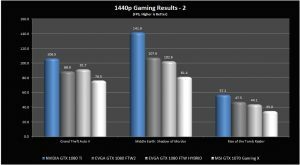 Metro and DiRT both show marked improvements over the GTX 1080 as well, especially at 2160p. 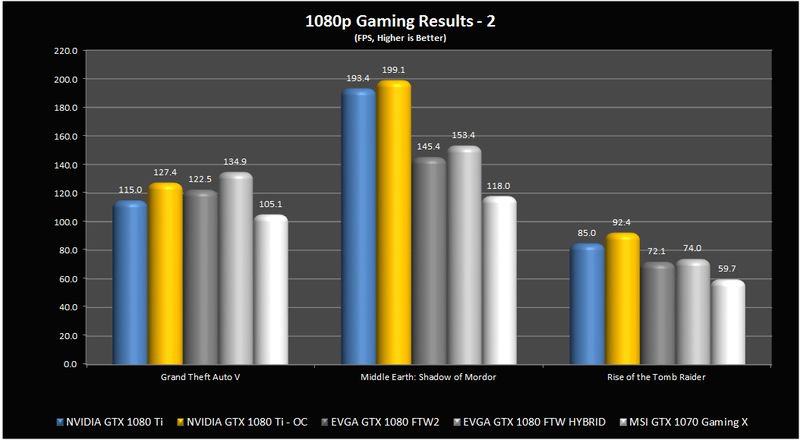 Across the board in GTA V, Middle Earth, and RotTR we see great gains at both 1440p and 2160p. All the gaps were in the ~20% range here, showing the strength of the extra memory bus and CUDA cores over the GTX 1080. 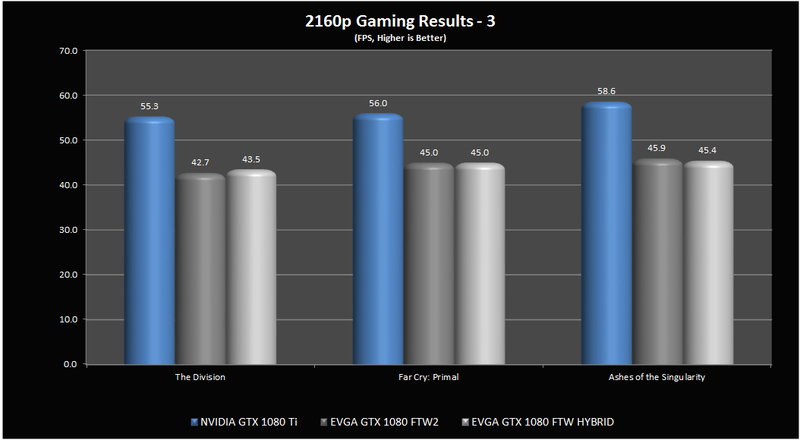 For the last of our 1440p and 2160p results we find The Division, Far Cry, and Ashes. Once again we get the same story, ~20% gains for the GTX 1080 Ti over the GTX 1080. Fans for the temperatures you see below were 50% or less, it was definitely quiet here. To keep temperatures below 70°C and avoid dropping boost clocks it needed ~65-70% fan speed. Noise from the fan starts picking up around 60%. 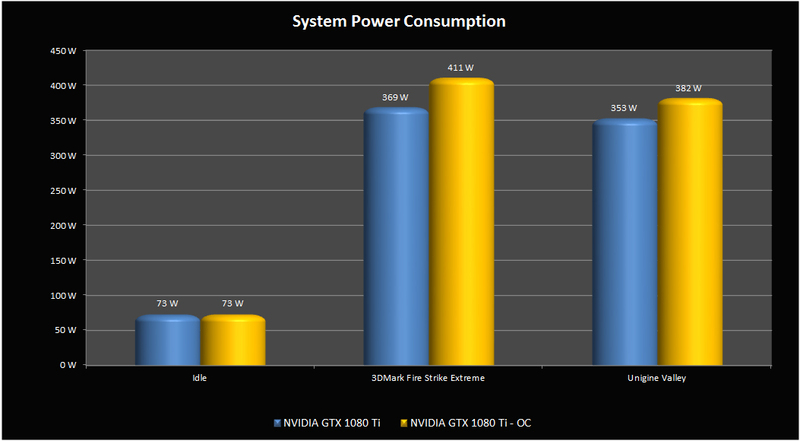 Power consumption is exactly what we would expect from a 250 W TDP graphics card. Stock the max power consumption at the wall was 369 W, meaning the system itself was only pulling a hair over 330 W. This bumped slightly to 411 W when the GPU was overclocked, but that’s still a power sipping system for sure. This card was rock stable at +154/+804 in MSI Afterburner. This gave us an actual boost of around 2000 MHz on the core and 6311 MHz on the Memory. Note, either the card, or version of MSI AB used (latest stable 4.3.0), would not allow voltage adjustment. So this was about the end of the road. I kicked up the CPU to 5.1 GHz and the RAM to DDR4-3866 18-19-19 then ran Time Spy again to get up to an overall score of 9,468. You can see in the first part of the test it held the clocks well as it was not bouncing off the power limit (20%), however get to the second GPU test and you can see the clocks start to fluctuate a lot more. You can’t see the power limit but we hit a max of 125% there causing the boost bins to drop throughout that testing. 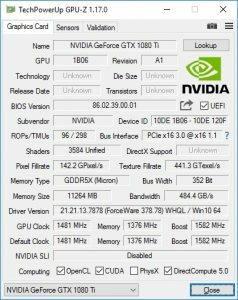 Nonetheless, it reaches 2000 MHz as NVIDIA mentioned, but that seems to be the limit for the sample, if only because of the power limit. Where it wasn’t hitting it, we were sitting over that around 2038 MHz. 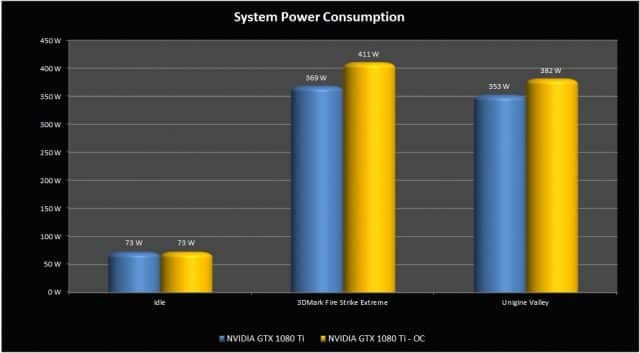 I can only imagine the AIC’s will, hopefully, have higher limits so we can overclock more. For a Founders Edition card though, this was solid. It is fast. If you’re looking for high resolution gaming, there is no other option on the market in my mind. NVIDIA increased the vRAM amount, memory bus width, CUDA cores, and more behind the scenes as well. This is their newest Founders Edition GPU, the GTX 1080 Ti, and for a gamer you’d be silly to buy the Titan X Pascal as you won’t notice the meager performance difference. As this is a 250 W TDP GPU we would normally expect high temperatures, but the added airflow on the reference cooler definitely helped. You can comfortably run this system, even fully OC’d, off of a quality 500 W PSU and not worry one bit. 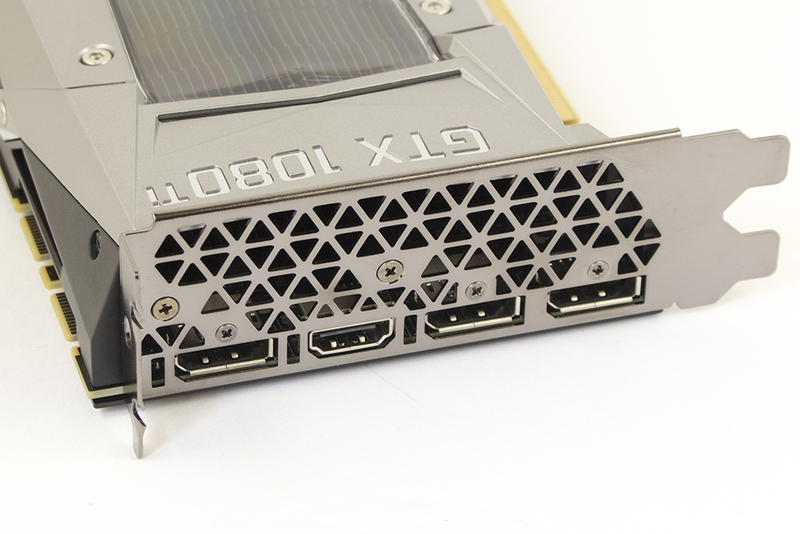 Even factory overclocked, water cooled, modified PCB options from GPU partners of the GTX 1080 don’t stand a chance against the GTX 1080 Ti. 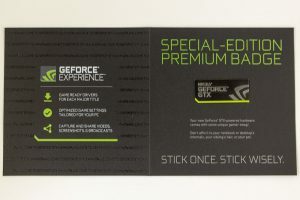 Even at the (pocket hurting) MSRP of $699.00, the only card close to this fast is $500 more. great review as usual austin! this card is a beast! Thanks buddy! Indeed it is a beast, can't wait to see what some of the partner cards are capable of. Same! they said they will be rolling out sometime in April, picked that up somewhere from on one of the YouTube TECH profiles. Anyway, looks like they hold their word, being faster then the Titan. cant get worse once better drivers are out as well. good times. Nice review as always. Let's see what the real world pricing brings. Thanks Soulcatcher, should see a nice spread from reference to LN2 monster as we typically do with the Ti cards. Yeah, definitely seemed like Unigine was CPU bound... especially Heaven. Could see evidence of that in a few games as well. Great review Austin, I notice how much of a beast this card is. I like how NVIDIA made it so it sits below the Titan XP but I have a gut feeling the trade of would be some games the 1080 Ti will eat the XP and visa versa. Would be interesting on the partner cards release and how well they will do under water. XD For me air is just fine but water for those water lovers would be a dream come true. So how loud is it really? Is 2ghz doable without earplugs? 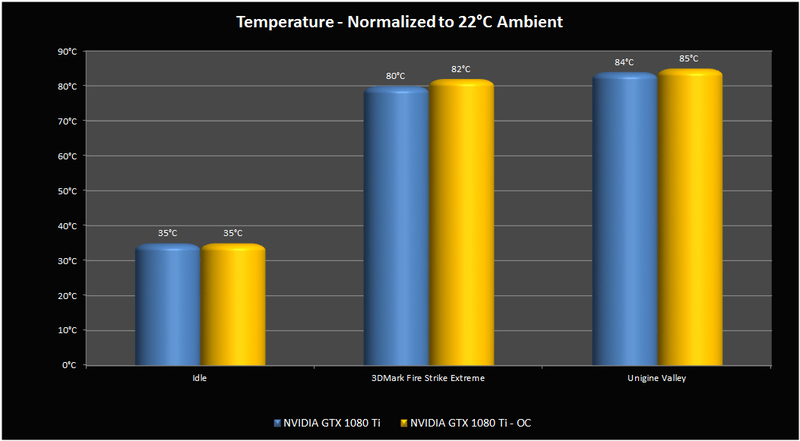 Depends on how sensitive you are, your case cooling, and ambient temps. It's loud, but not obnoxious, at 65-70% fan speed. That said, if you're worried about that, wait a few weeks for the partner cards to shake out as they're always quieter with the aftermarket heatsinks than the reference card. 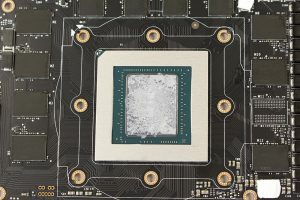 i was mainly thinking of nvidias claim of 5c better temps due to the new cooler and how close this will end up being to non reference cards like amp extreme etc. if everything is going to top out around 2000-2100 mhz anyways then all i care about is whether it will hold boost clocks over time with that kind of oc. what is the real oc'd boost speed after prolonged load at 65-70% (reasonable) fan speed? the temps arent a huge deal for me as long as the oc'd boost holds over 2000mhz or so without needing a fan speed so high that the computer flys off like an airplane. i like the idea of the heat leaving the case (to a point). btw i have 3 140mm fans in the front and bottom of my case aiming at the video card. 65-70% was what it required to keep it from dropping boost clocks in PTL. What your boost clocks and required fan speed are directly rely on your individual cooling situation, ambient temperatures, and of course the silicon lottery. ok thanks for that. the loudest thing in my case is a noctua industrial 2000 rpm 140mm pwm fan on my heatsink. it doesn't usually ramp up all the way in gaming. maybe during a stress test. i'm looking for a card with a noise level that doesn't go too far past that and holds its boost. i'm sure somebody will post a youtube vid with 1080ti fan noise soon.